A stretch of Highway 17 remains closed Tuesday morning after a rock slide blocked southbound lanes of traffic, but a massive mudslide near Scotts Valley that has caused traffic headaches for two weeks has been cleared. Tumbling rocks and debris closed both lanes of southbound traffic Tuesday night around 7 p.m. near Los Gatos, marking yet another closure for the main artery that links Santa Cruz to the South Bay. 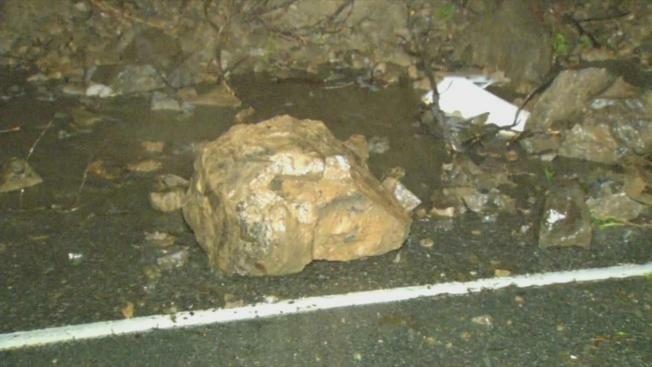 Caltrans crews hope to clear the rock slide in time for the Tuesday afternoon commute. While some crews cleared the latest hazard, others were able to reopen northbound Highway 17 near Scotts Valley after a massive mudslide forced limited access for nearly two weeks. Traffic was reduced to one lane in each direction using the two southbound lanes. Mudslide cleanup was not only problematic because of recent rain, it was emotional. One worker was killed on Feb. 9 after he was hit by a dump truck in a secured work zone. Another worker was also hit and injured. A historically wet winter season has pummeled the Santa Cruz Mountains with heavy downpours and gusty winds, triggering several mudslides and crashing trees. Those hazards have caused a number of closures and diversions for frustrated commuters. Motorists on Monday worked together to remove a large tree after it crashed down on the battered roadway and blocked all four lanes of traffic.